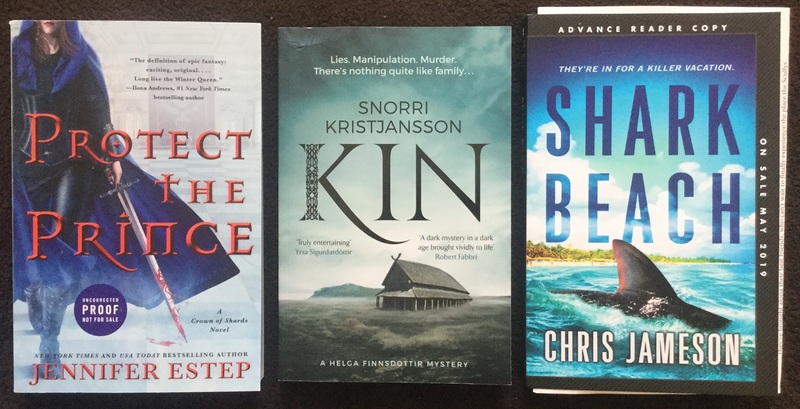 My thanks to the publishers and authors for the following review copies received, and be sure to click the links to their Goodreads pages for more details and full descriptions! First up, a trio of titles that span a range of sci-fi subgenres: with thanks to Titan Books, I received Fleet of Knives by Gareth L. Powell, book two of the Embers of War space opera/military science fiction series which I’ve been enjoying a lot so far; with thanks to Tor Books, I received Luna: Moon Rising by Ian McDonald, the finale in a fantastic trilogy which has been described as Game of Thrones in space; and with thanks to Orbit, I received an ARC of The Girl Who Could Move Sh*t With Her Mind by Jackson Ford, a quirky mystery adventure of paranormal elements and superpowers. Next, we have some epic fantasy, with thanks to Harper Voyager for sending along an ARC of Protect the Prince by Jennifer Estep, the sequel to Kill the Queen. I had a lot of fun with the first book last year, and I hope the trend will continue. A surprise paperback of Kin by Snorri Kristjansson also showed up earlier this month from the kind folks at Jo Fletcher Books across the Atlantic, I think because they had offered me an eARC of the sequel Council and I replied with a thanks but I haven’t read the first book yet. 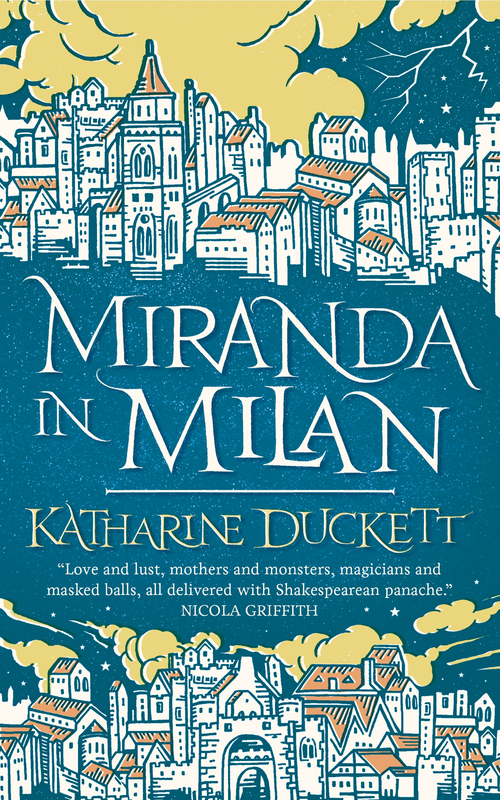 As you can imagine, I was thrilled because as you know I’ve been going on and on about how I wish this book would finally get an official US publisher. Needless to say I wasted no time in starting this book, and as of this writing I am about halfway through and enjoying myself immensely. And if you recall my Waiting on Wednesday feature a couple weeks ago, I was really looking forward to Shark Beach by Chris Jameson so it was to my joy and excitement that St. Martin’s Press replied to my request to say they would be sending an ARC. I probably won’t be starting this until closer to the release date, but I can’t wait. From Henry Holt and Co. via LibraryThing, I was also lucky enough to score an ARC of The Daughters of Temperance Hobbs by Katherine Howe from their Early Readers program last month. Really looking forward to check this one out. And here’s something different: from Vintage Books came this gigantic volume called The Big Book of Classic Fantasy edited by Ann and Jeff VanderMeer. It is exactly what it sounds like, an anthology of stories ranging from the fairy tales we first heard as children to the classic fantasy works that have always been with us. I’ll be honest, I don’t know how likely I’ll read this whole thing, but for those interested, here’s more from the publisher description: “There are the expected pillars of the genre: the Brothers Grimm, Hans Christian Andersen, Mary Shelley, Christina Rossetti, Nikolai Gogol, Franz Kafka, L. Frank Baum, Robert E. Howard, and J. R. R. Tolkien. But it’s the unexpected treasures from Asian, Eastern European, Scandinavian, and Native American traditions–including fourteen stories never before available in English”. Pretty cool, right? And finally, from the awesome team at Subterranean Press, I received an ARC of a collection called The Best of Greg Egan, which should be of interest to fans of the author. A rather light haul in the digital pile this week: courtesy of Harper Audio, I was able to snag an advanced listening copy of The Tiger at Midnight by Swati Teerdhala, and from Del Rey via NetGalley, I downloaded the eARC of The Cruel Stars by John Birmingham because I thought it sounded interesting. Here’s what I’ve managed to “unstack” from the TBR since the last update. It’s been a busy couple of weeks, with my birthday last weekend, and unfortunately right after that I came down with a bad cough and fever. Despite the hurdles I still managed to finish a good number of books, some of which were pretty lengthy (though for some of these I had the help of audio during my recuperation). Reviews will be forthcoming. I’m really liking it! A lot, surprisingly. I mean, the mystery doesn’t even start until after half the book is practically over, but I’m loving all the strange and wonderful dynamics of this family! 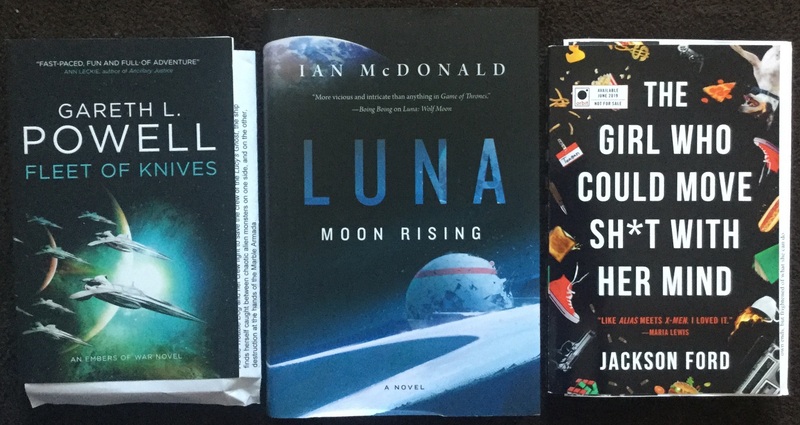 Both A Fleet of Knives and Luna: Moon Rising are lined up in my reading queue: to say I’m excited about them would be a massive understatement! 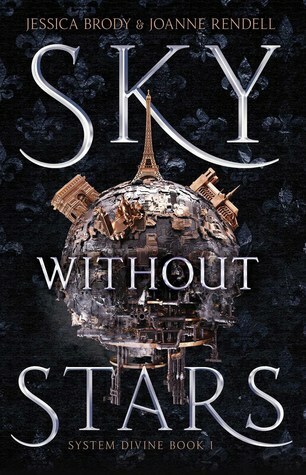 And The Cruel Stars looks very interesting, so thank you very much for showcasing it! Yes, I’m hoping to read all of these soon! I feel spoiled by all this sci-fi goodness! 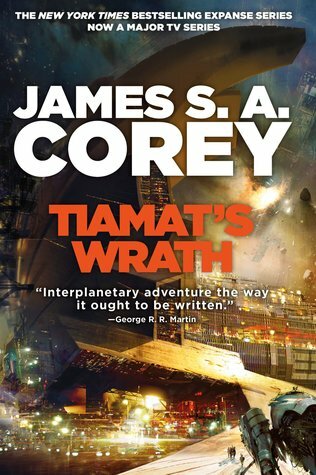 You read Tiamat’s Wrath?! How was it??? OOoh nice! I just read Protect the Prince a week or two ago and really liked it! I cannot wait for the next one in the series!! It’s a very exciting one I think, I couldn’t really get into Jennifer’s main adult series but I definitely like her fantasy one! Shark Beach looks creepy! Beaches terrify me because of sharks, lol. I hope you end up enjoying all of your lovely new reads! I’m so excited to hear that about Protect the Prince. The first book was so fun, I can’t wait for more! Game of Thrones in space? I’m intrigued! I’m certainly planning to read Shark Beach when it comes out! Yes, the Luna series is very much like that! A lot of political intrigue and scheming among the big mining houses on the moon! Very entertaining! 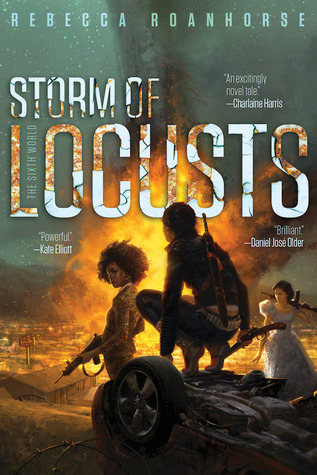 Uhh, I’m very excited to read the first book of Jennifer Esteps series, Kill the Queen, later on in the year. I’m also stoked to read the Josh Malerman book you managed to read. 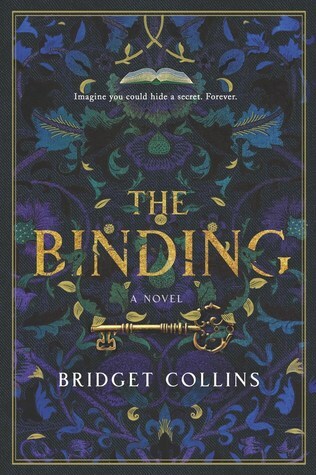 The Binding is on my list, too. 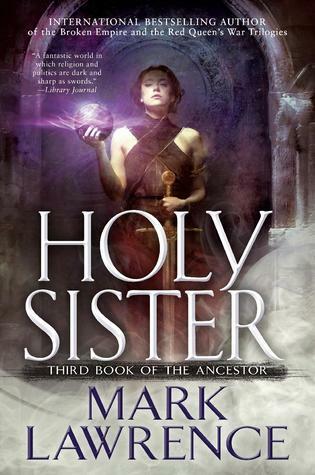 And I NEED to finally get to a Mark Lawrence books in 2019, too. Great post! The Jennifer Estep book was so fun! Kill the Queen was my first book by her, and I couldn’t have been happier with the way it turned out. 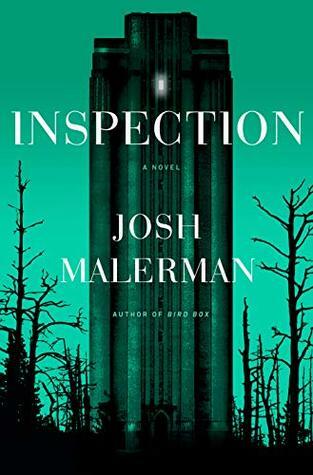 Unfortunately I did not enjoy the Malerman book as much as I’d hoped, but I hope it works for you! Happy belated birthday! I was tempted by The Cruel Stars but decided against it, although I may change my mind later. And I’m really interested in Kin! I’m curious to read your review. 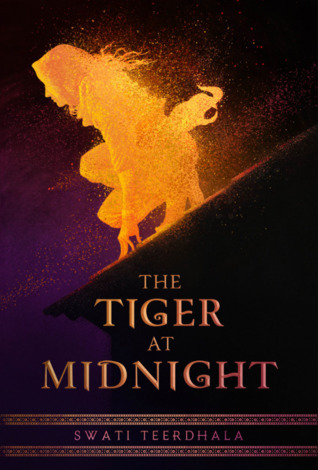 I’m so curious about Tiger at Midnight, love to hear your thoughts! I loved your thoughts on Kill the Queen, hope you enjoy the sequel! I’m very curious about Tiger at Midnight as well, I was so glad I was able to get it in audio because I can probably get to it sooner now, lol. I really enjoyed Kin – it was just so refreshingly different and I’m looking forward to picking up Council. I can see why you like it! I’m so hooked on the family drama lol! I really enjoy Protect the Prince. Happy reading! I was so excited to hear how much you liked it, now I can’t wait to read it! Those Luna covers (and descriptions) keep drawing me in, but I haven’t taken the plunge yet. Same with Shark Beach. And Kin looks pretty awesome! The Girl Who Could Move Sh*t With Her Mind sounds so great! First time I’m hearing about it. I’ve been pondering getting Protect the Prince when it’s out. The first book was derivative, but kind of fun as well… Hmm! I agree! It was the title that caught my attention too! 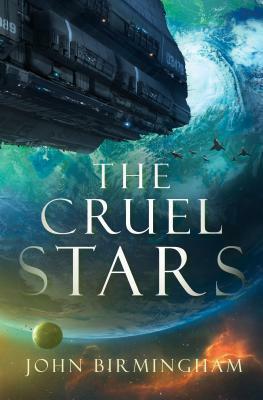 I am definitely going to have to check out The Cruel Stars! The cover is just gorgeous and you’re right, it sounds really interesting! Such a great haul! I’m really becoming interested in The Girl Who Could Move Sh*t with Her Mind…I mean, the title alone lol. Also Cruel Stars looks pretty good too! Haha, yeah I have high hopes for The Girl Who Could Move Sh*t With Her Mind now…and yes, it’s because of the title! That was a stroke of marketing genius, lol! Right! Gets the concept and tone across right up front with just a few simple words.